I took a lot of pictures today but decided to do some restoration work on an old photo of my dad for today's post. This photo of Edward H. Sullivan was taken in 1945. 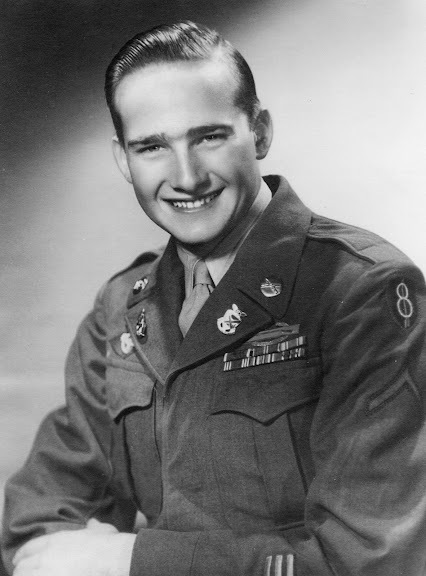 Dad retired from the U.S. Army after 20 years and served in France and Germany with the Eight Infantry Division in WWII and during the Korean Conflict with the 25th Infantry Division. He was twice awarded the Bronze Star Medal with Valor and also the Combat Infantry Badge and the Purple Heart with several Oak Leaf Clusters. Dad celebrated his 18th birthday in France in August 1944, six weeks after coming ashore at Normandy as a 17 year old soldier. He passed away on January 15, 2005. Happy Father's Day dad, I sure miss you. What a beautiful tribute. He sounds like he was a very cool man.